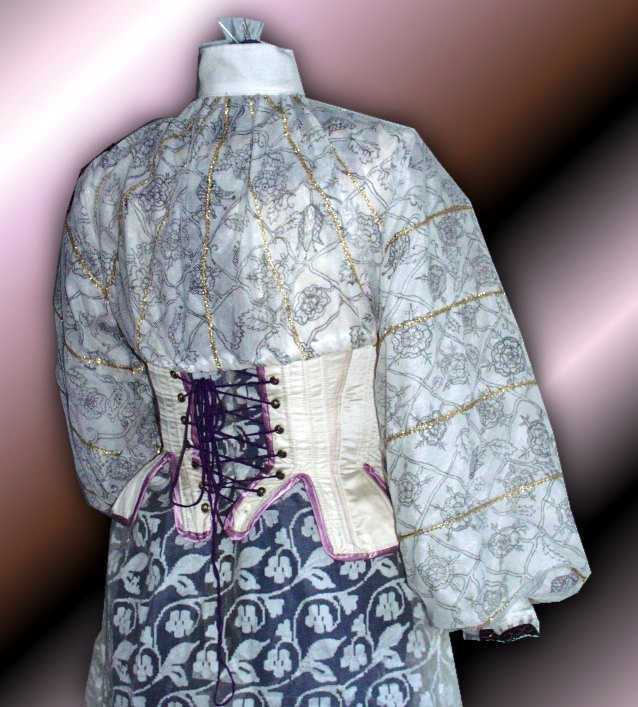 Note that I made the partlet and sleeves in 2005. 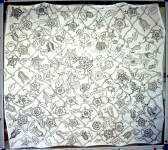 If I had to redo it today, I’d probably skip the painting and instead use Spoonflower’s printing service to have my blackwork fabric printed, if I wanted ‘fake blackwork’ fabric. 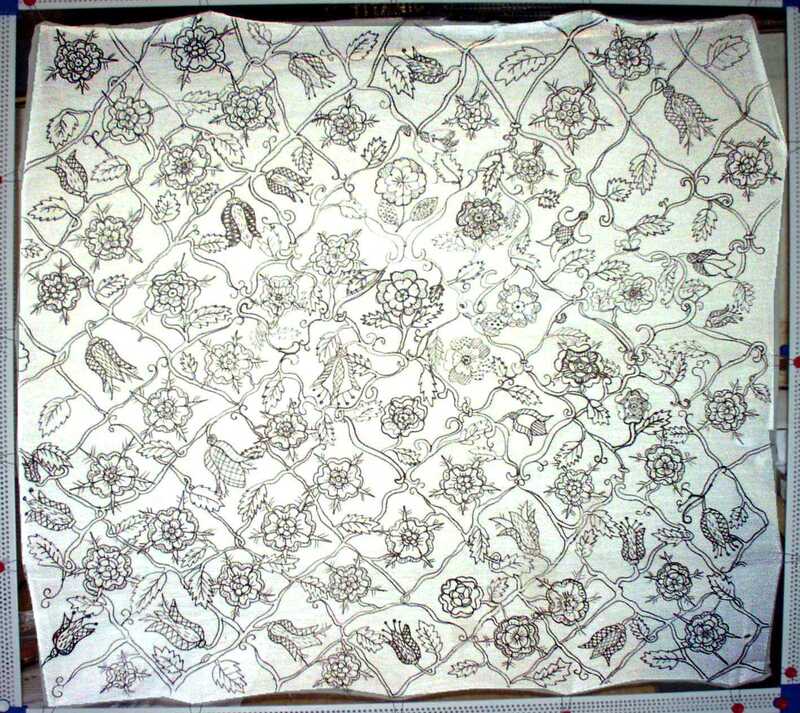 And just so that others may have it easier than I did in 2005, I’ve created a design on Spoonflower which actually imitates “stitched” blackwork (by embroidering one repeat of the design, then digitizing that and turning it into a seamless repeat). 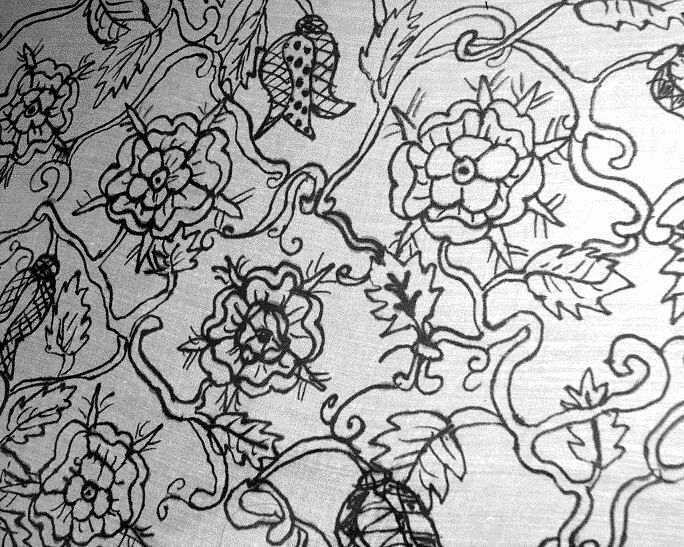 Moreover, I’ve even created said design as Blackwork and Redwork – you can find my “mock Blackwork” fabric and the “mock Redwork fabric” on Spoonflower. Then again, of course, I do have a larger (and growing!) 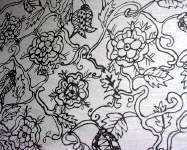 collection of Tudor / Elizabethan / Jacobean fabrics on Spoonflower; so you may just want to look at & consider those for your next Elizabethan garb project! 😉 ). I’m very patient, yes. 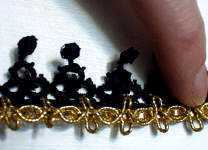 In fact, I’m incredibly patient – someone once said that I must have “the patience of a saint” to do what I do, when seeing my “Isabel” doll gown, especially the stays. …this is where the fine black permanent markers come into play. 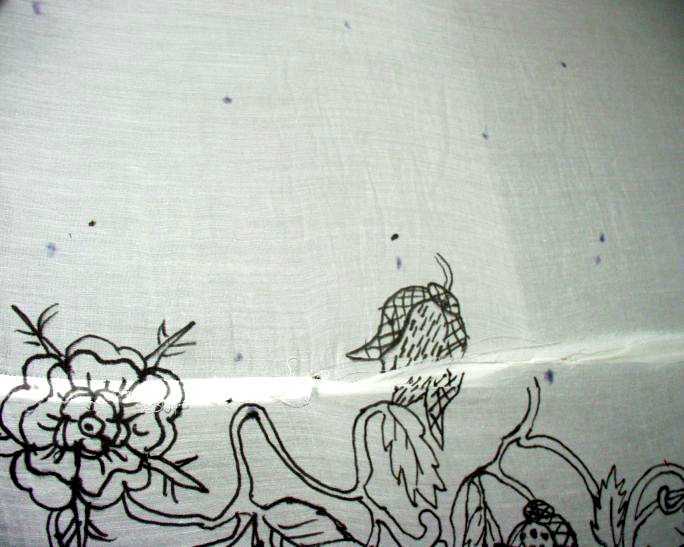 I’ve cut the sleeves and partlet parts from the fine silk-linen batiste I had – a beautiful material, slightly crisp, yet soft; structure likely to silk organza – but not that stiff. 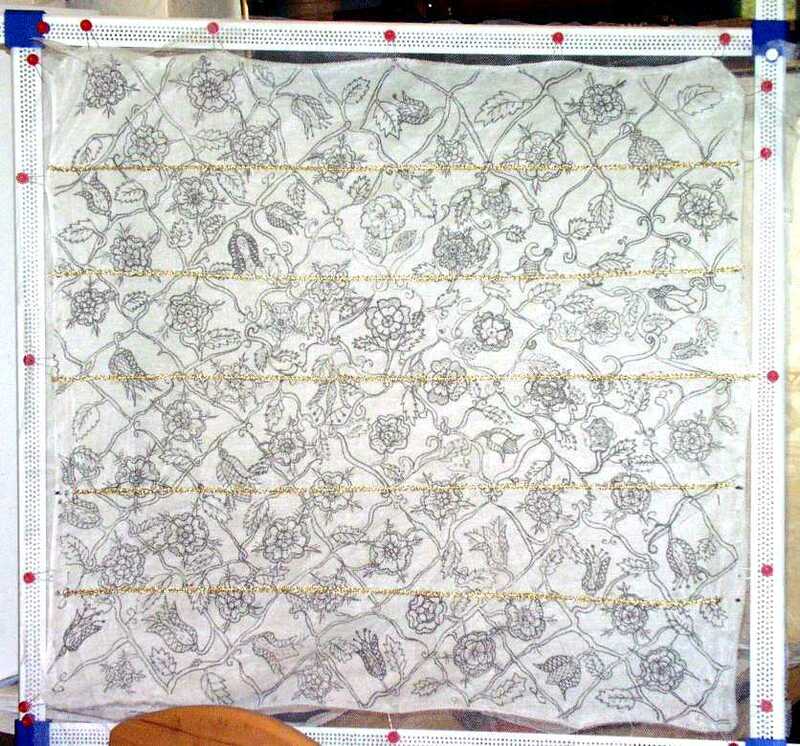 ….actually painted the blackwork designs from the portrait free hand with the permanent black markers on the fabric, giving the utmost care to actually imitate the embroidery stitches on the flowers. I know it’s probably not historical (but again – who can tell if some Vandyke gowns (= painter’s gowns which were used by painters for painting “templates” for portraits, to which later the faces of the people actually portrayed were added) were not decorated just that way?). Yes, I definitely agree that a gown like this would deserve real embroidery. 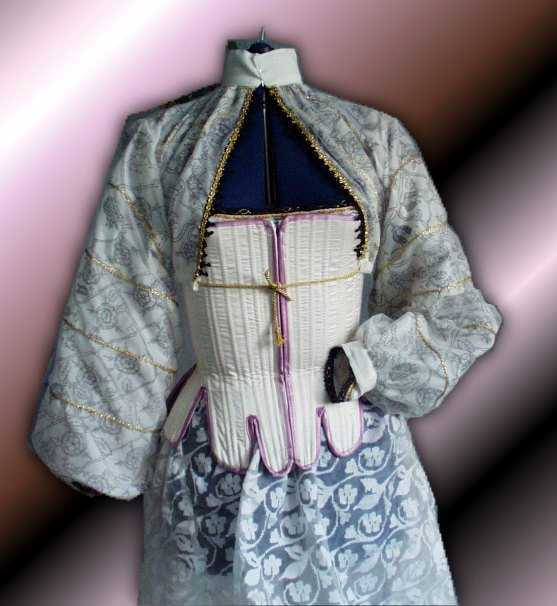 However – I am not planning on ever entering any competitions with this gown (basically because of the fact that where I live, we don’t have any possibilities for such competitions); and if I would, I could still use the narrow sleeves I cut from the forepart fabric and a different, actually embroidered – though not so elaborately – partlet. 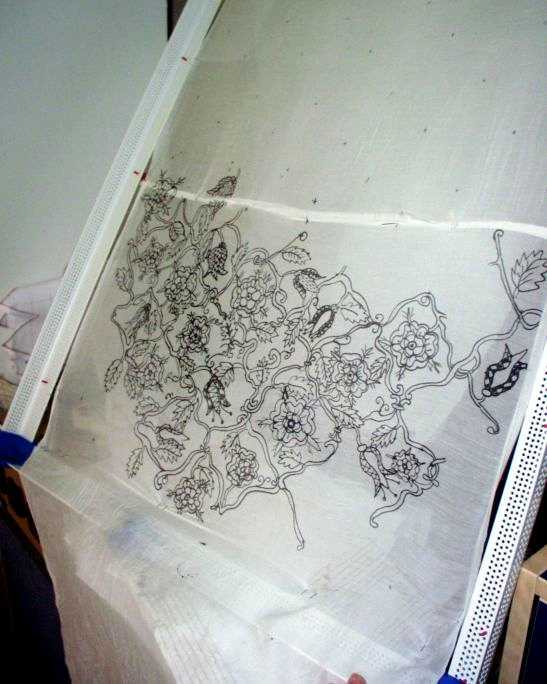 But I wanted to have a similar design to the actual portrait partlet and sleeves embroidery, but could not afford the time to really embroider them – neither by hand nor by machine, which takes about as long as the hand embroidery as each design has to be programmed – by hand. I am nevertheless quite proud of what I have managed to paint here. 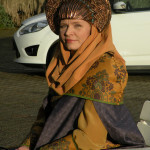 As I have already said, the process of painting was also quite slow (though of course it did not take as long as actual hand embroidery), plus I now have a clothing item which is probably absolutely unique in design and style. In other words: It’s mine, and I like it. 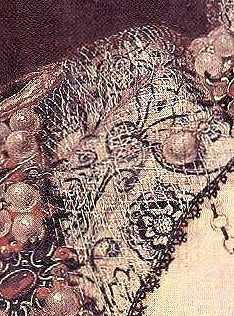 I think I have put a considerable amount of work and time into those sleeves and partlet, and to me, both look beautiful; and someone looking at the gown would have to come closer than one yard’s distance to actually be able to tell that this is not blackwork embroidery but painted. The painting process took a long time – I’ve had that frame in my kitchen for weeks, and each time I felt like it when passing it by, I painted some more flowers to it or changed the fabric in the frame when I had finished a piece. I have written a short tutorial – or rather photographed it – on how to paint Tudor Roses by hand without a template; it can be found in the tutorials section of this site. 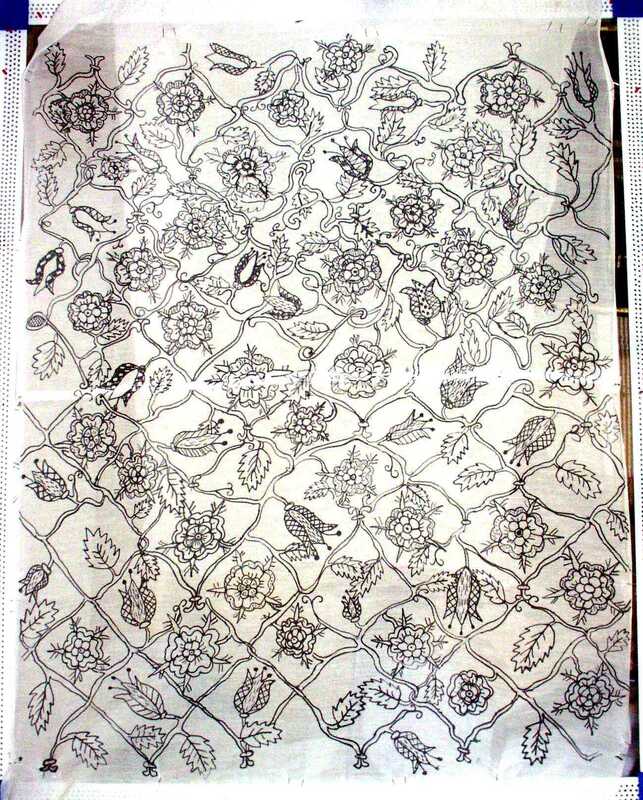 As I have painted the designs free hand, meaning with no template but the cover of “Queen Elizabeth’s Wardrobe unlock’d” which was lying next to the frame all the time, not two flowers I have painted look the same. 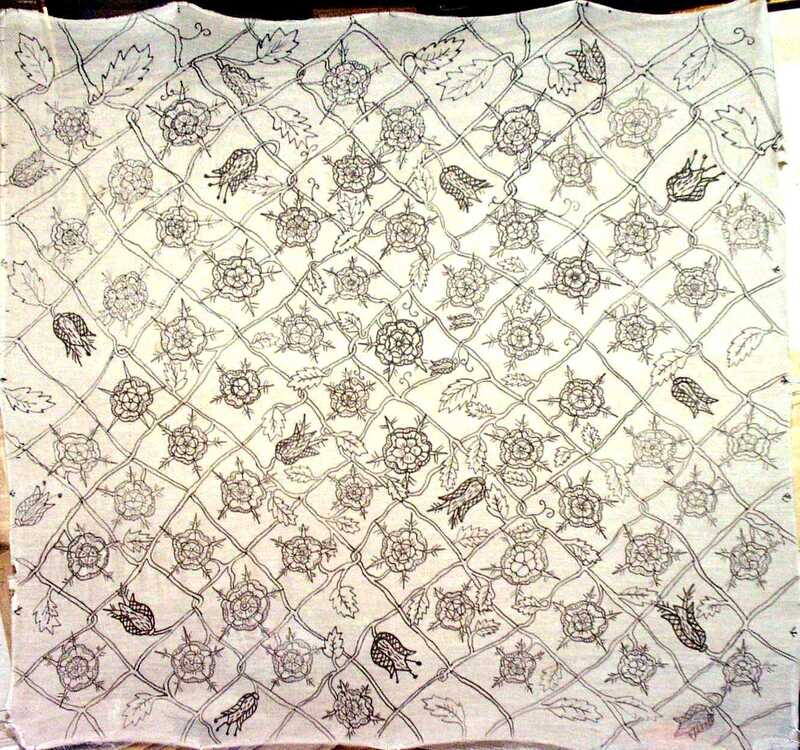 The only template I made for myself, to make the placement of the designs easier, was to place some dots on the fabric in a diamond shape; here to be seen in the top area of the picture. The seam running from left to right results from the fact that I had to piece the bit of batiste I had, so… this is the shoulder line seam. 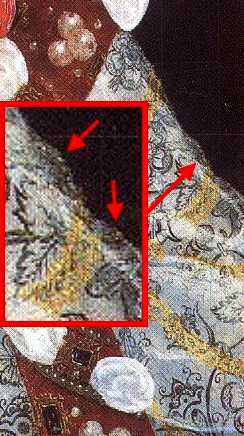 I discovered at a later point of time that the pattern which I had in mind and which I therefore painted wasn’t exactly the pattern of the portrait gown’s partlet and sleeves – but at that point of time I had already painted one sleeve and was half finished with the partlet, so I just continued to paint the designs “my way”. Now you may take a minute to picture me walking through town at night, one foot stepping on the pavement, the other on the street, wearing that gown, one hand clasping a bottle of wine, singing “My Way” at the top of my lungs. I am in no way responsible for beverages or anything else now dripping from your computer screen. Just to give you an example how much work the painting of these flowers was, I will give you a number. 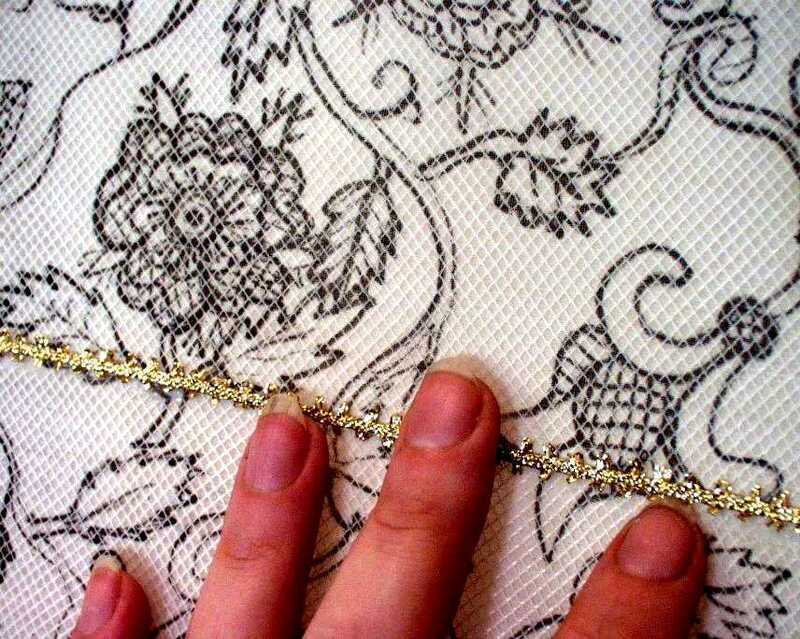 As I have said, I have painted the fabric – *very* thin silk/linen fabric that would not take much color when painted – with fine black permanent fabric markers. These fabric markers *usually* hold, well, like forever if you always close them after use – especially on a very thin fabric, such as this batiste. However, I needed no less than *three* markers for the painting of partlet and sleeves. I repeat: Three. This will perhaps give you an idea how many flowers, vines, leaves and buds I have in fact painted – I know that it’s quite difficult to determine that from just a few photographs, let alone the finished garment, which lets the fabric – as it’s bunched up – look much less than it actually is. If you would also like to do something like this and like the designs I painted, but feel unable to draw something like this free hand, here are three pictures for you which you can enlarge to the size you need. 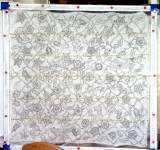 I guess this would also make a fine blackwork template; except of course that the squares are missing. The choice of netting was not so simple. 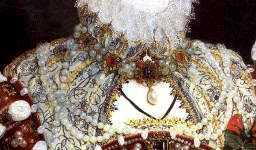 the ‘Pelican’ portrait’s netting is much finer; as to be seen above. Now – tulle would have been a great choice, just that I find it too stiff. 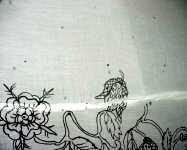 Plus, it has octagon shaped holes and this netting – no matter if the netting in the ‘Pelican’ or ‘Phoenix’ portrait – has diamond shaped holes. After thinking about this for some time, I’ve incidentally found and bought a nice and soft mosquito net and cut my netting from it. 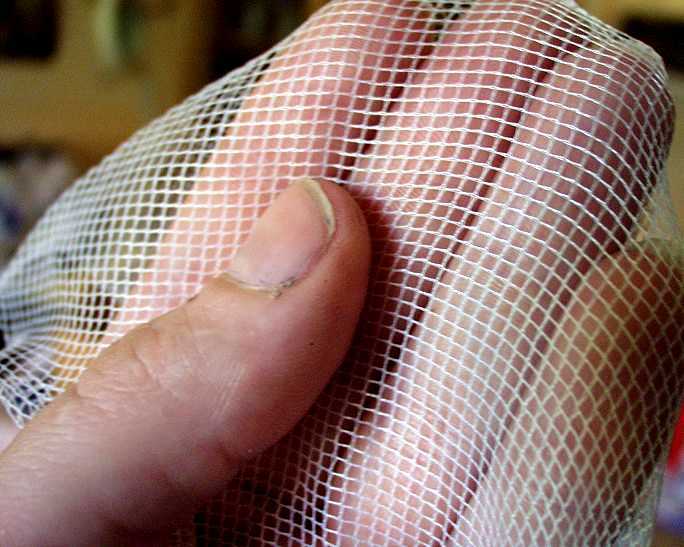 I has a *very* small diamond shaped netting, much smaller than the one which was used on the Pelican gown’s partlet – the holes in the netting are no bigger than in tulle, just that they are no octagons but diamond shaped, so I liked this choice a lot. 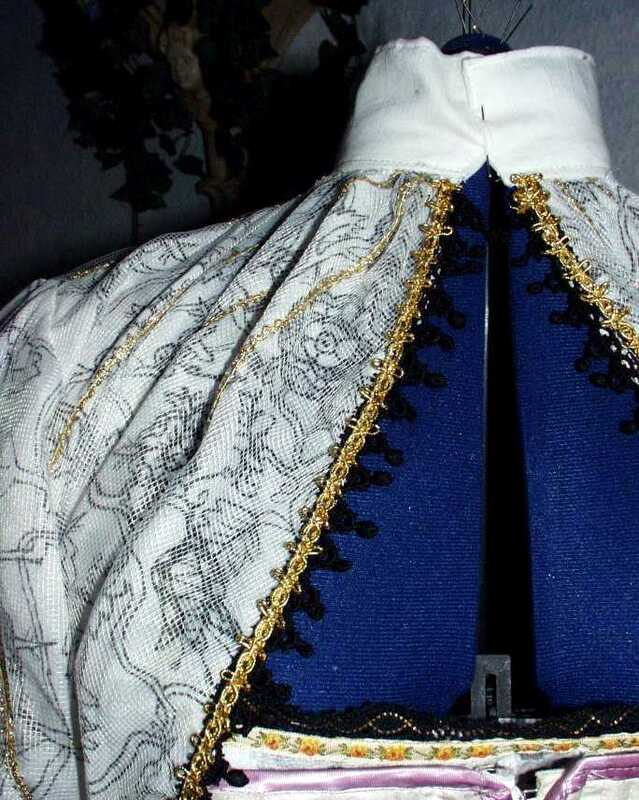 I then did another, perhaps not-so-historical thing with those sleeves- and partlet double layers of painted batiste and golden trimmed mosquito netting – I’ve sewn them together, *all* together; so basically this is a partlet with sleeves. Just to repeat it, this is no translation error: I have made a partlet with sleeves. On the other hand – who can say that this is absolutely not historical? 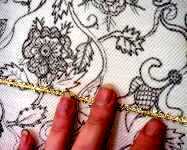 Now let’s move on to the jewelry making, which has a very own chapter and different pages in this web. 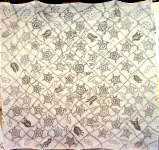 I made my first partlet with the sleeves attached due to time constraints, and it looked pretty fab. I don’t have any evidence that sleeves might have been sewn to the partlet, but it makes logical sense to me that one might have some “everyday” partlets with the sleeves pre-attached for ease of wearing–and that these would be the garments that would wear out more rapidly. And it’s not like the Elizabethans didn’t know how to attach sleeves, I mean, since they’re on like every smock ever. Personally, I think yours looks absolutely fabulous that way, and why would you ever WANT to switch out the sleeves for it?